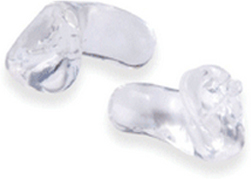 Improve the performance of your existing earphones by adding a custom fit adaptor made from an impression of your ear. The custom fit sleeves offer more secure fit and better isolation when compared to the generic tips supplied with the earphones. It may be possible to make sleeves for other manufactures as well. Please note that it is often required that the earphones accompany the earmold impressions to the lab to ensure an appropriate fit. Custom sleeves are also available for the standard earbuds that come with most MP3 players. Custom sleeves are also available for a variety of mobile phone headsets including many Jabra and Jawbone Bluetooth Headsets.